It's been a 4 year hiatus for Nikita 雅涵 Tu-Bryant since her last stage appearance in the South. Right off the back of her release with her band Flite (Ed Zuccollo [Trinity Roots, Rhian Sheehan], and Rick Cranson [Little Bushman, The Woods Band]), and currently deeply absorbed in the preparation of her upcoming play at Wellington's BATS Theatre in December - Tu-Bryant is seeking a respite with some quiet adventures in the South. During her 10 days, she will be playing just 3 shows. With support from Blenheim's Chloe Vitale Music, Christchurch's Monique Aiken, and Dunedin's very own Gulls - her road trip will see her visit Picton's best live music venue Le Cafe Picton, the one and only The Mussel Inn in Takaka, and her debut appearance at Dunedin's Dog With Two Tails. 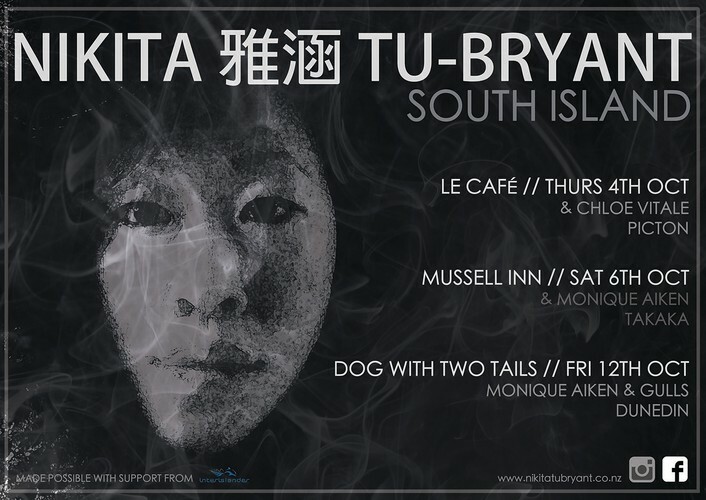 If you have never seen Nikita 雅涵 Tu-Bryant perform, expect a storyteller of truths - if you have been anticipating her return, here's your chance to reconnect with her, and her music. Koha entry with support from Monique Aiken (CHCH), and Dunedin's very own Gulls. This tour would not have been possible without the support from Interislander - Thank You for supporting NZ Art and Art making.